Marineserv Ltd. is a Company first established in 1992, but with more then 45 years experience in Ship maintenance and repair. Our Company is one of the first , to use modern technology as Infrared photograph as a method of detecting serious defects onboard ship that can result in fire hazards or major break downs in Engine room. This method will save the ship owners substantial cost on repairs with out open up the engines and other machinery, and with a fraction of normal repair cost. Infrared maintenance can also detect and prevent dangerous electrical board and transformers potential wiring problems. We believe IR is an excellent preventive maintenance measure, and should be part of 1/4 yearly preventive maintenance on any ship, and will also prevent Fire Hazard situations. We are now able to offer full service and spare parts from our new partners in Greece. As of large storage place, our partners are buying in large scale, and therefore able to reduce prices on spares considerably. Check with our service and spare prices before order anywhere else. You will be glad you did. 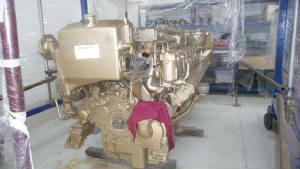 MTU Engine Reconditioned In Greece. 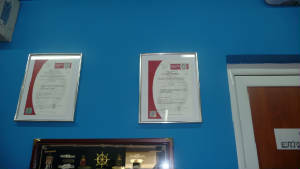 Greek MTU Approved Service And BV Certification. Another costly repair in connection with Main Engine repairs is the Turbocharger! Before going ahead with such repair you should check out our prices on spares and repairs. Did You Know That The Turbocharger Give 75% Of Engine Power! 10% loss (Hardly notable) in Turbo performance is more then 10% increase of fuel consumption! One of our strongest side is finding the reason for your technical problems to prevent it from happening again. In many cases problems re-occur as of not finding the reason for engine brake downs or other technical problems. Based on 45 years experience on ship repairs and maintenance, we are able to prevent or limit expensive engine or machinery damages by simple troubleshooting and diagnostic maintenance on regular bases. It is sad to see many Cruise companies buy old Cruise ships and Ferries, and after a few months the ships have big technical problems. Before buying ships, one should always check the ship from bottom and up, not from top to bottom. Most look at the ships hotel interior, and forget completely that the most important with a ship is the technical status. Mostly we believe the reason is Surveyors lack of technical knowledge. Ship and ship equipment evaluation survey can be a important money saving investment when buying ship or equipment or charter a ship. Often ship looses the charter and end up paying huge repair cost because of technical brake down. The money invested in such pre-charter or pre-buy survey can pay off many times over when investing money for future gains in shipping. We have many years ship maintenance experience, and can give you the best evaluation of your investment before you buy or charter. We also give survey to evaluate for other purposes. But Your Problem Is There! If you are interested to have a photo collection of your ship passing the Panama Canal, please click on banner above, "Ship Photos" to read more and see photo samples.